Mike McCloskey, bottom left, led a group of Temple University students, alumni and staffers in completing the Broad Street Run on Sunday morning, raising money for a local charity. This photo shows last year's group. Michael McCloskey has been an avid runner for years. 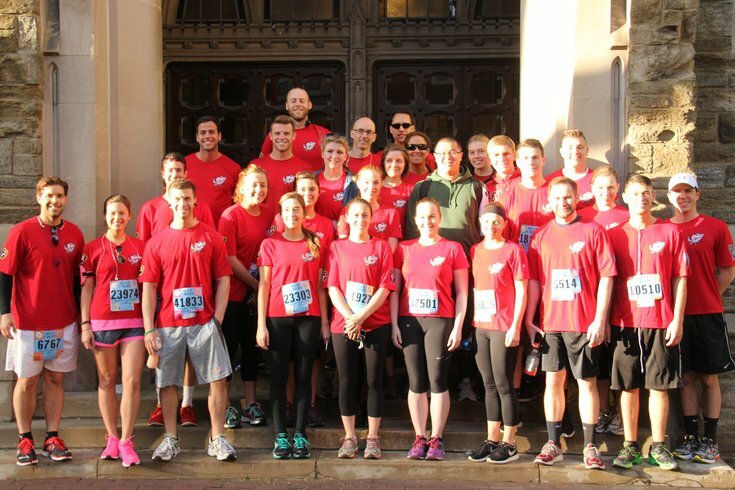 So when he was hired as a professor at Temple University's Fox School of Business, McCloskey quickly organized a group of students to run the Broad Street Run with him. About 15 students signed up. Eight years later, McCloskey is still running the Broad Street Run. This year, he was joined by 250 runners, again raising thousands of dollars for a local charity. The group ran down Broad Street on Sunday wearing customized T-shirts. After the race, they all returned to North Broad Street for a BBQ on campus. And why not celebrate? They ran 10 miles Sunday morning, beginning near Einstein Medical Center and finishing at the Navy Yard. Plus, they raised about $5,800 for ARTZ Philadelphia, a nonprofit that helps people living with dementia rebuild their self-esteem through artwork. "Everything we get goes to the charity," McCloskey said. "We don't have to pay for anything, which is awesome. We just keep getting bigger and bigger every year. It's great. It's a lot of fun." Over the years, McCloskey combined forces with a similar running group comprising Temple police officers. Now, their group includes a mixture of students, alumni, staff and faculty. Many of the same runners return each year. They each get a kick out of running through Temple's campus, where a pep band pumps out music and football players offer runners high-fives. "With the Broad Street Run being such a Philadelphia run, it's a blending and coming together of our university that makes it worthwhile," McCloskey said. To participate, the runners donate $20 to a charity selected by Temple's chapter of Gamma Iota Sigma, a national professional organization for risk management and insurance majors. That gets each runner a T-shirt designed by Ivory Ella, an apparel company owned by Temple alum Richard Henne. And it gets a charity a nice chunk of money. Each year, Gamma Iota Sigma selects a different charity to support through a series of fundraisers throughout the school year. No fundraiser is bigger than the Broad Street Run. McCloskey's runners have donated more than one-third of the $15,000 raised by Gamma Iota Sigma. Patrick Cohen, president of the Temple chapter, said Gamma Iota Sigma seeks to benefit charities that connect with its members. But it also tries to find lesser-known charities that don't regularly receive large amounts of funding. "To some larger organizations — we know they'll definitely take the money, but we won't see that direct impact," Cohen said. "We try to choose an organization that doesn't see a lot of funds and that the $15,000 will jump-start a lot of their initiatives." The group raises money through bake sales, 50-50 raffles and charity auctions. But the Broad Street Run greatly adds to the pot. And the larger the Temple group gets, the more money it can send to a charity in need. "We definitely want to have this grow and grow each year," Cohen said.